But the ranks of Millennial and Generation X eligible voters have been growing, thanks to the aging-in of Millennials and naturalizations among foreign-born adults. These generations matched Boomers and previous generations as a share of eligible voters in 2012 and are now estimated to outnumber them. 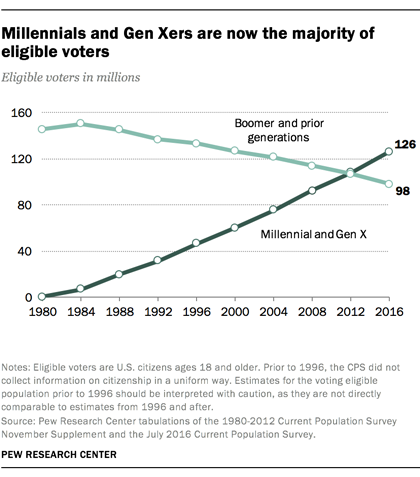 As of July, an estimated 126 million Millennial and Gen X adults were eligible to vote (56% of eligible voters), compared with only 98 million Boomers and other adults from prior generations, or 44% of the voting-eligible population. Although the electorate is increasingly comprised of younger generations, this does not imply that the electorate as a whole is getting younger. Perhaps more importantly, eligible voters don’t necessarily translate into actual voters – that all depends on who shows up to vote on Election Day. 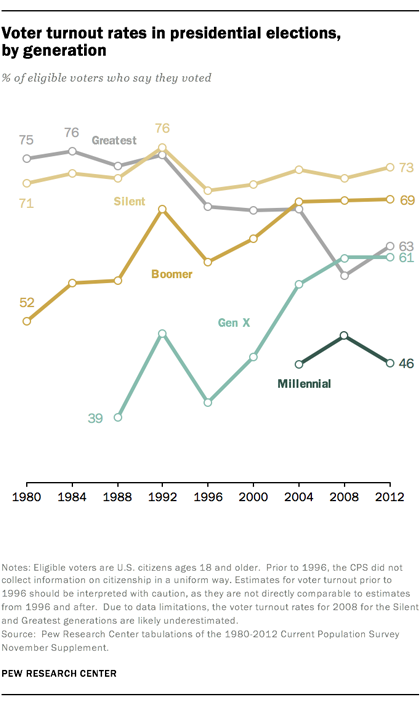 Whether Millennial and Gen X adults outnumber Boomers and other generations in November will hinge on voter turnout. In the 2012 election an estimated 70% of eligible voters in the Baby Boom, Silent and Greatest generations voted. 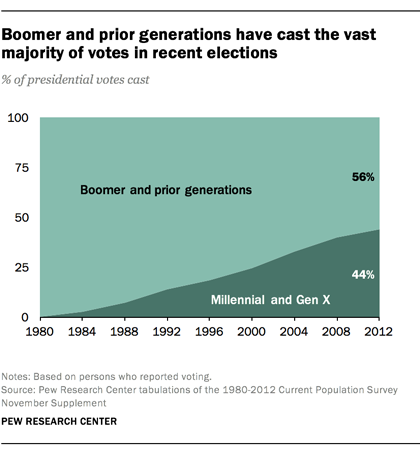 Turnout among these generations was similar in 2004 (70%) and 2008 (69%). If (and it’s a big if) 70% of Boomer-and-older eligible voters turn out in November, Millennials and Xers could match them even by turning out at much lower rates. A turnout rate of 70% among older voters would translate to 68.6 million votes. Millennials and Gen X could match that number of votes with a turnout rate of 54.5%. This level of turnout among the two younger generations seems plausible based on past elections. Historical patterns of voter turnout by generation also suggest the likely end of dominance by Boomers and prior generations. In general, as a generation ages, turnout rises, hits a peak, and then declines. Among those in the oldest living generation, the Greatest Generation, turnout crested in the 1984 election at 76% before declining. Similarly, turnout among eligible voters in the Silent Generation peaked at 76% in the 1992 election. 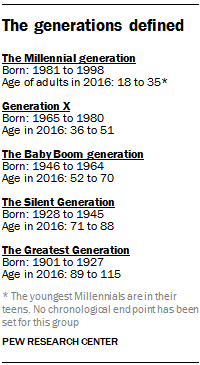 The Millennial and Gen X generations are likely still on the upswing in terms of their turnout rates, so it is a reasonable guess that at least 54.5% of these adults will vote, and perhaps more. We won’t know until after November if Boomers and their elders will pass the torch to Gen X and Millennials as a share of voters, but all the available data suggest that the 2016 election will mark the beginning of a new era for U.S. presidential elections.